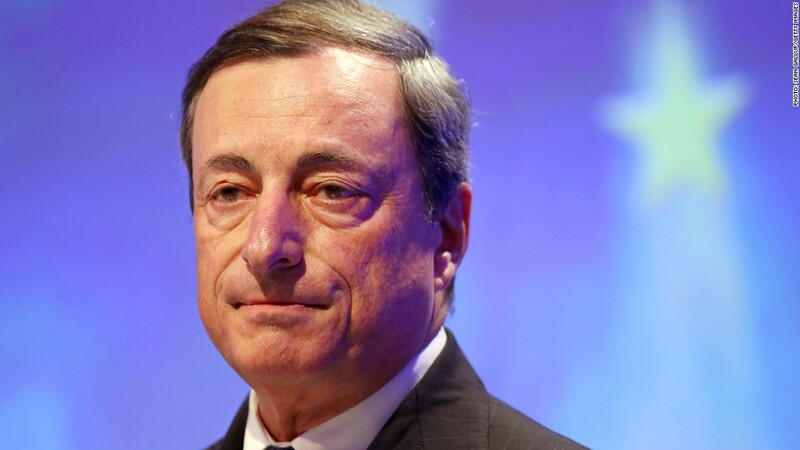 Mario Draghi said the ECB had a "downward bias" on interest rates, taking the unprecedented step of issuing guidance on future policy as rising bond yields threaten the European economy. Europe's central banks sought to protect their struggling economies from a Fed-induced spike in borrowing costs Thursday by signaling that they'll continue to provide cheap money for the foreseeable future. In a significant break with previous practice, the European Central Bank and Bank of England gave investors much more insight into future policy and warned about the possible impact of a rise in market interest rates -- triggered by higher yields on U.S. Treasuries after the Federal Reserve said it could begin to tighten policy later this year. "The governing council expects the key ECB interest rates to remain at present or lower levels for an extended period of time," ECB President Mario Draghi said at a news conference. The bank decided to keep rates at a record low of 0.5%. Recent survey data have pointed to a stabilization in the recession-hit eurozone economy and accelerating growth in the U.K., but Draghi said the risks were tilted to the downside. He joined new Bank of England Governor Mark Carney in warning about tighter global money-market conditions. Draghi said the bank's governing council made a unanimous decision to issue forward guidance with the aim of signaling a "downward bias" in interest rates for the foreseeable future. The ECB will adjust its guidance as the medium-term outlook for inflation, growth and credit flows changes, he said. While this may be a pale imitation of the Fed's approach of linking policy to a specific target for unemployment or inflation, it represents a major shift for the ECB, which had refused to issue guidance in its 15-year history. "Like Mark Carney's Bank of England earlier today, the ECB wants to signal to markets that monetary tightening is further away than some implied market expectations would suggest," said Holger Schmieding, chief economist at Berenberg. Investors cheered the dovish talk, sending European shares sharply higher and the euro and pound lower against the dollar. Sentiment was also helped by signs that Portuguese politicians are trying to prevent a government collapse. The Bank of England earlier kept its interest rates at a record low of 0.5%, and its asset purchase program at £375 billion. Economists had played down expectations of any dramatic changes at the bank under Carney's new leadership this month, saying markets would probably have to wait until August, when the bank could begin to issue forward guidance on interest rates along the lines of the Fed. Recent business surveys suggest the U.K. economy may have grown by as much as 0.6% in the second quarter. That's double the rate seen in the first three months of the year, when it managed to avoid a triple-dip recession. House prices have also been on the rise. But analysts have warned that the economy is still far from the "escape velocity" Carney has been hired to help deliver. Household finances are still squeezed by falling disposable incomes and government austerity measures, and loans to business and individuals are still choked. Turmoil in the eurozone remains a risk for U.K. exporters. IHS Global Insight chief economist Howard Archer said the bank's decision to issue a statement signaled a significant shift towards providing forward guidance on monetary policy. "Amid increased global financial market turmoil, the monetary policy committee likely felt it was a good move to make it clear at an early stage that any tightening in UK monetary policy is a considerable way off," he said.